charming house in ST Martial Entraygues 5km of Argentat in an exceptional setting of water border in the valley of the Dordogne. We took our 12 & 9 year old to this secluded house for a week and were a little concerned they might find it a tad dull... how wrong could we be! We were all so sad to leave it after a week cycling, canoeing, swimming, with a bit of table tennis thrown in. This charming house gave us one of the most relaxed, fun filled, active holidays we have ever had, and we all equally fell totally in love with it - inside and out! We didn't even feel the need to visit the huge list of local attractions we were presented with by Yves, after a very warm welcome... we will save them for the next - longer - visit! Pictures just cannot do justice to this stunning property. The grounds stretch alongside the Dordogne river and the wooded hills rise up behind the house and on the other bank giving perfect seclusion without feeling in the least isolated. The terraces and lawns are dotted with different places to sit and to enjoy the peace and the gentle views. The house is equipped with everything you could possibly need including Kayaks, bikes, sunloungers as well as every household appliance. The house contains the most wonderful range of old and antique objects which just add to the charm. The owner was very friendly, charming and could not have been more helpful. The advice and information he provided directly contributed to our wonderful holiday. The town of Argentat is only a few minutes drive away. It is full of character and charm and very rewarding to explore. One negative point - we ate there a few times but found the restaurants a little overpriced and the food not of a particularly high standard. Perhaps we were just unlucky. The area around Argentat is beautiful. We found it hard to tear ourselves away from the house but when we did we were treated to the most wonderful scenery. I would heartily recommend this property, I could not fault it. A very wonderful and memorable holiday. My wife and I have for many years spent our summer holidays renting superior accommodations all over Europe, and I am pleased to say that this wonderful home is one of the most memorable. The house was exactly as described and even better, what appealed to us most was the complete tranquillity of the surroundings. The grounds are extensive and full of song birds it truly is a veritable Shangri-La. The interior is very comfortable and well equipped with a wonderful view from the lounge overlooking the river. The owner was the perfect host who we met on our arrival and was very solicitous in every way. We spent a great deal of our time cycling around the surrounding country side and visiting the very many sites of antiquity, the lovely quiet local villages and restaurants, but for us the crowning glory of the whole trip was returning home after a wonderful (sometimes hard days ride) and taking a swim in the river and afterwards relaxing on the patio in the wonderful peaceful surroundings. I would like to thank our host Yves Peyrou for a wonderful and very memorable stay. I couldn't imagine that the house and grounds could be more beautiful than the fotographs! But this turns out to be the case! This house has everything one could desire for a beautiful vacation. 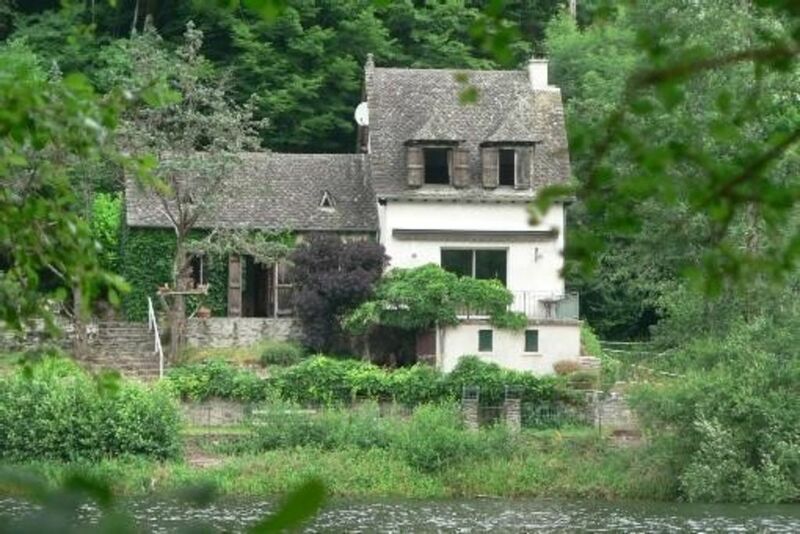 Right on the Dordogne River, with every imaginable ammenity. Peaceful and breathtakingly beautiful. The owner is charming and considerate, helpful and generous. The town of Argentat is wonderfully quaint and offers shopping and restaurants. We will be going back at the next possible opportunity. Wir kamen aus Deutschland und waren total begeistert von der französischen Charm der Correze. Das Haus am Fluß liegt auf einer kleinen abgelegen Straße. Für Wanderer, Fahrradfahrer, Kayaker und Kanu-Fahrer ein Genuß. Im kleinen Argentat kann man gut einkaufen oder essen gehen. Rund herum gelungen! Fünf Sterne für die Lage und das Grundstück. Das Haus ist alt und mit alten Möbeln eingerichtet. Leider ist es nicht sehr gepflegt. Geräte waren defekt (Staubsuager , Toaster, Sonnenschirm) und das Haus ist vollgestopft mit Erinnerungsstücken des Besitzers. Es gibt offensichtlich Probleme mit der Feuchtigkeit vom Fluss her während der kalten Jahreszeit. Auch hatten wir Probleme mit Hornissen, dir durch die Feigenbäume direkt am Haus angelockt werden. Die Dordogne ist an dieser Stelle ein Stausee und kein Fluss, was das Vergnügen am Wasser etwas einschränkt. Der Wasserspiegel schwankt stark je nach dem Wasserbedarf der Kraftwerks. Yves war sehr freundlich und bemüht. Superbes vacances dans ce cadre idyllique et la vue est magnifique depuis la maison. Tout y est pour passer un agréable séjour : baignade devant la maison, plusieurs terrasses pour profiter de la vue. Le propriétaire met à disposition des vélos, un canoé, un kayak et divers jeux. Il est toujours à l'écoute de ses locataires. L'accueil est très sympathique. Adresse à conserver et à faire passer aux amis. A one hour drive heading west towards the discovery of the Lot and admire the castle of Castelnau, the beautiful view from Loubressac, Autoire, visit Rocamadour, you press underground in the Padirac, the caves of Almost ... .